600The Children’s Flight of Hope 2017 Annual Report has just been released, revealing another year of tremendous growth and support in its mission to provide air transportation for children to access specialized medical care. 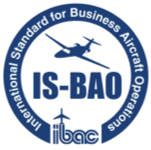 Causey Aviation is proud to support this mission. Download the full report here. 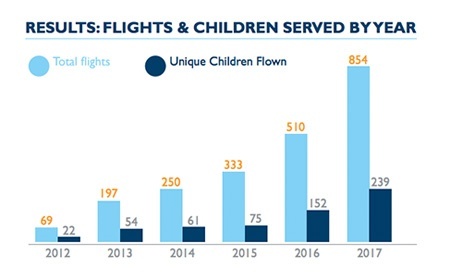 In 2017, Children’s Flight of Hope offered 854 flights, allowing 239 children to receive care at 54 medical facilities to treat 82 unique diagnoses. 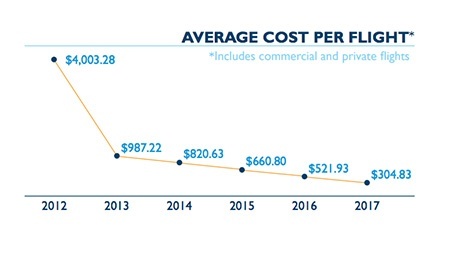 The increase was possible due to expanded aviation partnerships and programs, which reduced the average flight cost to a new low of $304.83. 2017 was also the first full year of CFOH’s partnership with American Airlines, which allowed resources to serve more families around the country and expand internationally, helping families in 25 countries access health care in the US. CFOH is the only nonprofit that offers both commercial and private flights. Children’s Flight of Hope is an independently funded nonprofit, with no government funding or insurance reimbursement, which means every dollar makes a difference, whether it comes from their generous “Donor Crew” of individuals and corporations, or fundraising events like the Wheels Up Party & CFOH Golf Classic, Triangle Hops for Hope, and A Vintage Affair. When life-changing treatment is available to help a sick child, nothing should stop them from reaching it. Unfortunately for many families, the specialized medical care their child's needs is located far from home, and the cost and logistics of air travel keep treatment out of reach. You can help these families by joining Vector AeroMedical and Causey Aviation in supporting Children's Flight of Hope, a North Carolina-based nonprofit that provides free air transportation for children to access specialized medical care. Donate to Children's Flight of Hope to provide a flight for a child to access treatment and give HOPE to a family when they need it most. Together we can do more. You can also donate to Children's Flight of Hope through the purchases you are already making on Amazon. Just visit smile.amazon.com and select Children's Flight of Hope in order to donate .5% on eligible purchases. The price of your items does not change and the service is free to use. To donate through Amazon, you must visit smile.amazon.com each time you make a purchase. You'll only have to choose Children's Flight of Hope once. As an independently funded 501(c)(3) organization, Children's Flight of Hope would not be able to support the hundreds of families that depend on their services without donors like YOU and our aviation partners like Causey Aviation and Vector AeroMedical. Find out more about the great works of Children’s Flight of Hope and how you can help by visiting their website and Facebook page.